Ground turkey rules everything around me! When you do your monthly Costco run and home home with four packages of ground turkey, you immediately grab your phone and bring up Pinterest and type in — ground turkey + dinner = WA LA, you get thousands of ideas. I’ve always really liked the idea of bell peppers, but I don’t think they always agree with my body. For some reason when I consume them raw, my body is confused. But when they are cooked, my body accepts them wholeheartedly. I wasn’t sure if J and L really liked them, so I figured they could eat the filling as dinner if they didn’t want to eat the whole thing. Turns out, stuffed peppers are pretty freakin’ easy OR Crissy over at Dear Crissy just made it super easy for me. Her Pin picture was what drew me to her recipe, which I used for dinner, thanks girl! went to Safeway to grab all the ingredients, besides the ground turkey, rice, and garlic. well, I also added a can of tomato paste in the cart just in case. 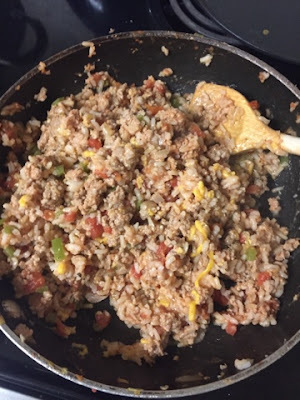 For the recipe, please use the link above and go directly to Crissy’s blog for the recipe. Thanks! Like I said before, I wasn’t sure if the fam was going to want to eat the bell peppers, so I only made two, actual stuffed bell peppers. I don’t know why, but I was surprised to read the instruction to boil the bell peppers. Duh! That’s how you get them soft, but it just threw me off I guess. Anyways, my filling did NOT turn out as good looking as Crissy’s looks, but it did taste good. Also, those pesky bell peppers are not all grown equally, now I know why she says to blunt off the bottoms, so they stand up in the pan! I got the approval of the filling by L and kinda by J. He wanted more salt and hot sauce, but I’d rather it be slightly less salty, because you can always add salt not remove it from a dish. And L and I can’t handle heat, so no way I was adding hot sauce. However, I did sautee some of the bell peppers for the filling, so I did add that little bit to change it up a bit — and sneak in some veggies to the filling for L! Also, cause I’m random, I decided to eat the filling on top of a bed of mixed greens. I decided that I’d have the stuffed bell pepper baking for lunch the next day instead of waiting for it to bake. It was a little unconventional dinner, but it worked and I was adding in some greens, which is always a plus. I should probably be embarrassed at how the filling is not so pretty to look at, but I’m not. As long as the fam eats it and says its ‘okay’ then I’m willing to take that as a win. It’s if they say they don’t like it or worse, don’t eat it…that I’ll take that as a loss. I guess my annoyance at Pinterest is lessening with each “Diary of a Non-Cook” posting I make. Thanks to L, I am trying to cook more. I guess trying is better than not trying….